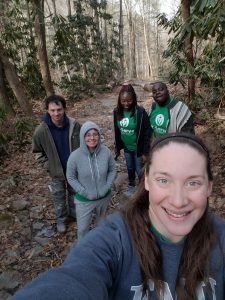 For more than 30 Eastern Mennonite University students, spring break wasn’t just a chance to get away from classes for a week. Instead, it was a chance to make a difference – and learn. Y-trips traveled to Puerto Rico, West Virginia, Florida, Georgia and Alabama to volunteer as construction workers and tutors, learn about immigration, and visit key sites of the civil rights movement. Celeste Thomas, director of multicultural student services at EMU, led a civil rights tour in Alabama and Georgia that was attended by Ivan Harris, Jourdyn Friend, Hailey Holcomb, Hannah Nichols, Ezrionna Prioleau, Jakiran JD Richardson, Alex Rosenberg and Precious Waddy. In Selma they attended the annual Bloody Sunday church service at the Brown Chapel AME Church (as did U.S. Senator and Democratic presidential candidate Cory Booker and former Secretary of State and presidential candidate Hillary Clinton). Members of the group then joined a march with Clinton, Booker, Jesse Jackson and Sheila Jackson, and students participated in a “Dead In” on the Edmund Pettus Bridge. Throughout the week they also visited museums and sites such as Tuskegee University and the Washington Carver museum in Tuskegee; the Dexter Avenue King Memorial Baptist church and Rosa Parks Museum in Montgomery; Kelly Ingram Park and the 16th Street Baptist Church in Birmingham; and Ebenezer Baptist church and the Center for Civil and Human Rights in Atlanta. In Birmingham they met Sarah Collins, whose sister was one of the four girls killed when the 16th Street Baptist Church was bombed in 1963. “It was amazing to see her and hear her story,” said Harris – but he found the trip valuable also because it provided him with an understanding of how history continues to live on in current events. “When I was growing up, when I was first taught about the subject of black history, I thought that everything that happened in the past just stayed in the past, and I grew up thinking that it really isn’t that much of a problem anymore,” he said. Over the years as he became more aware of racial injustices, however, he decided he wanted to learn more – and this trip was a chance to study in-depth. 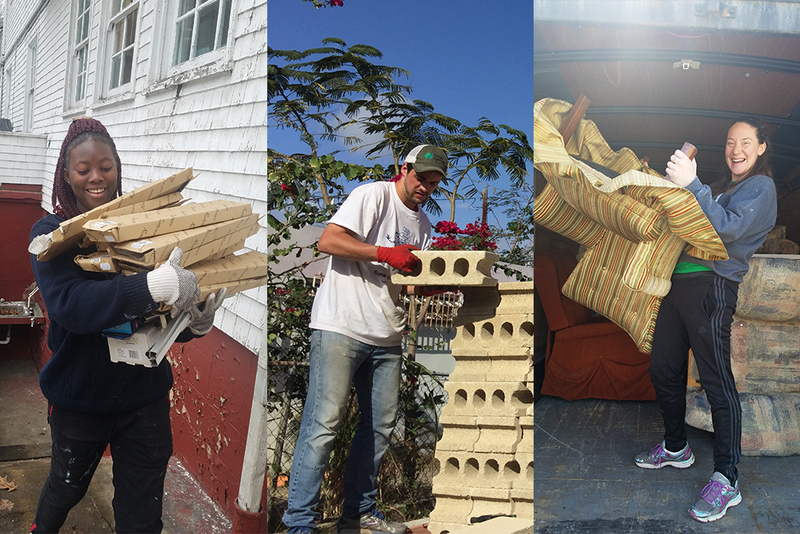 Jonas Beachy, Reuben Peachey-Stoner, Andrew Reimer-Berg, Jonathan Reimer-Berg, Joshua Schlabach and Andrew Schunn served with Mennonite Disaster Service (MDS) in Florida, installing drywall, building walls and more at different worksites. They had time to relax, too: they went birding and swam at Sanibel Island. But most fulfilling for Peachey-Stoner, he said, was living and working with the MDS crew of retirees. 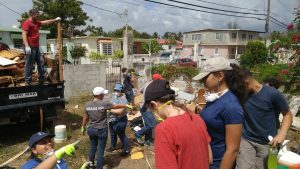 At Alterna, Lahr and her group mates – Benjamin Canizales, Anton Flores, Joshua Gomez, Bekah Mongold, Maria Saucedo, Kayley Scottlind and co-leaders Ariel Barbosa and Otoniel Suero Escalante – stayed with host families and tutored elementary school students in the afternoons. Lahr noticed that in spite of the difficulties they faced, the families in the community exhibited happiness. “It was a reminder to me that you don’t need to be wealthy to be happy,” she said. The group also visited people being held in an immigration detention facility, and on another day went to Alabama to walk the last leg of the Selma-to-Montgomery civil rights march and visit the Legacy Museum: From Enslavement to Mass Incarceration and the National Memorial for Peace and Justice. Lahr said the lessons she learned were important. “I feel like everyone needs to go there,” Lahr said. Katie Wenger, Silas Driver, Erin Brubaker, Jonah Short-Miller and Maria Yoder volunteered with MDS in Puerto Rico, where they tore down a house destroyed by Hurricane Maria. Future MDS groups will construct a new house in its place. What was most significant for Wenger and Driver was time spent building relationships with people there. That welcome included home-cooked meals for lunch and dinner: “One thing that stuck out to me this trip was the generosity of the families that cared for us during our time there,” said Driver, who over the week-long stay grew close to his host brothers. A final team went to Kimball, West Virginia, where one of their tasks was preparing a new location for the headquarters of Sharing with Appalachian People (SWAP). 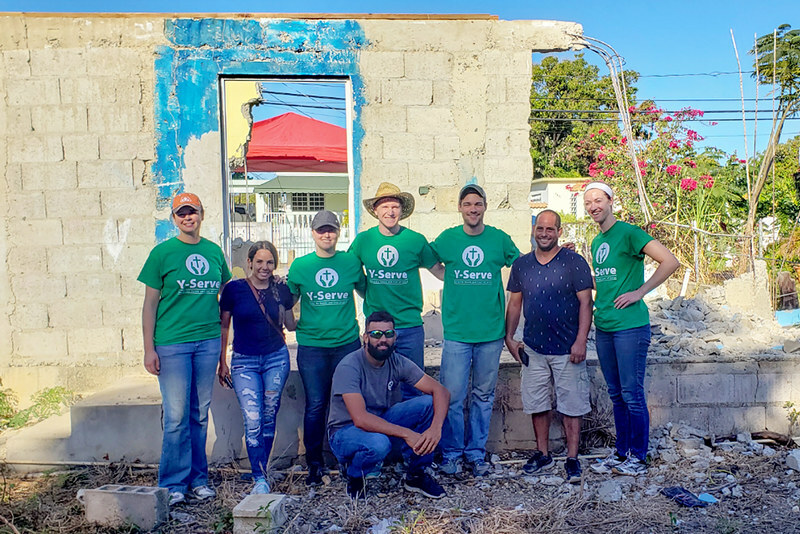 The group – Lydia Haggard, Jack Hummel, Lydia Musselman, Christian Nwankwo and Christiana Nwankwo – hung drywall, painted, installed flooring, and moved lots of furniture and supplies. But like other groups, the relationships they formed and strengthened were most valuable.